Hiding in Plain Sight the "Higgs Bison"
The cave paintings left by our ancestors can be very evocative. The often elaborate and highly stylised frescoes represent life in the very distant past, a life so far removed from today. 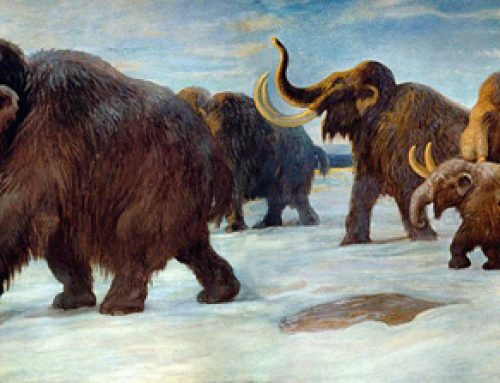 However, the paintings, in most cases, a record of the animals that shared the environment with these hunter/gatherers, hide hidden clues regarding prehistoric animals that modern-day researchers are only just beginning to appreciate. A report published in the journal “Nature Communications” by scientists from the University of Adelaide, documents the study of DNA recovered from fossil bones in order to map how climate change affects large animals. A surprise awaited the scientists, they have discovered a previously unknown species of bison, only to find out that this bovine was already recorded on the walls of caves across Europe, such as in the Niaux Cave (south-western France). These cave paintings are dated to around 17,000 years ago (Late Upper Palaeolithic). In 1999, the Australian-based research team commenced the study of DNA extracted from bison bones excavated from a number of sites located in the northern hemisphere, where the Steppe bison (Bison priscus) roamed. The objective of the study was to assess the impact of changing global climate upon animal populations and in North America the fossil record for bison reflected the impact of a changing world. Bison numbers crashed around the Last Glacial Maximum (between 18,000 and 21,000 years ago.) Such data supports the idea that climate change played a significant role in the extinction of “megafauna”. The scientists then expanded the boundaries of their research by examining data from South America, this also revealed that rapid warming events were a significant factor in large animal extinctions, often with species being further pushed towards extinction by the effect on animal populations by human hunters. When the focus of the research was directed at the fossil record and climate data from Europe, a rather puzzling picture emerged. By studying mitochondrial DNA (which is inherited exclusively through the maternal line), recovered from fossilised remains, the team realised that the genetic signatures they were finding did not match those expected if the fossils had come from the Steppe bison (Bison priscus). This was something of a puzzle as palaeontologists had thought that the Steppe bison was the only species to have been present in Europe before 10,000 years ago. The researchers realised that there were looking at the genes of something novel, an unknown species distantly related to modern cattle and to the exceptionally rare European bison (Bison bonasus), also called the Wisent. The European bison is Europe’s largest, native, extant terrestrial mammal. Once widespread, this bovine is now found in a few, remote and protected forests, particularly the Białowieża Forest between Belarus and Poland. In a story, somewhat similar to the more famous Przewalski’s horse, the last wild Wisent was shot in 1927, but the species clung on thanks to a handful of animals kept in protected reserves. Modern herds are descended from just a dozen individuals, including one bull from the Caucasus. That famous Australian dry sense of humour came to the fore, when the DNA from the fossil bones proved to be neither Steppe bison or modern European bison, the team thought they had a new species but they could not be certain. The elusive animal was nick-named “Higgs bison”, after all, the team had found evidence of something new, but they were not quite sure what this animal looked like, a parallel with physicists and their search for the Higgs boson particle. In order to unravel this “Higgs bison” puzzle, the University of Adelaide research team set out to confirm their mitochondrial DNA results by obtaining nuclear DNA from the sixty-four European bison bones involved in the study. Although, much harder to retrieve, nuclear DNA records all aspects of ancestry, not just the maternal line. The small amount of nuclear DNA retrieved from the samples demonstrated that the “Higgs bison” was a hybrid, a cross between a female wild cow (extinct Aurochs) and a male Steppe bison. The team dated this hybridisation event to more than 120,000 years ago. This ancestry was the same for the Wisent and even though the mitochondrial DNA was different, a consequence of the recent near extinction event for the European bison, the “Higgs bison” was revealed as the ancestor of the Wisent. Pressure on bovine populations as a result of rapid fluctuations in climate could have triggered the hybridisation process. Male offspring of the Aurochs/Steppe bison cross were sterile, a common outcome for mammal hybrids. As a result, several generations of females back-crossed with Steppe bison males (maybe even the same bull), resulting in a genetic ancestry of about 10 percent Aurochs and 90 percent Steppe bison. Genetics and cave art reveal the assymmetric hybridisation between female Aurochs and male Steppe bison. Male hybrid offspring are sterile, and female offspring backbred with Steppe bison for several generations, possibly the same bull. Having reached this conclusion, the Australian team then set about finding other sources of evidence to support the idea of a newly discovered species of prehistoric bison, resulting from the cross breeding between wild cattle and Bison priscus. Two strands of supporting evidence were identified, both from surprising sources. Scientists from Holland reported that amongst the many numerous Steppe bison and Aurochs bones dredged up by fisherman from the North Sea (for much of the Pleistocene Epoch sea levels were much lower and Scotland was joined to Denmark by a wide and extensive plain), bones of a less common, smaller bovine had been found. French cave art researchers had identified two distinct forms of bison depicted in the artwork of our ancestors, one type resembled the hump-backed, massive Steppe bison, whilst the other depiction was of a more evenly shaped animal with reduced horns, much like a modern-day Wisent. 820 examples of bison depicted in European cave art are known, two distinct forms have been identified, representing two different species. Radiocarbon dating of the artworks showed that the wedge-shaped form was drawn when Steppe bison were present on the landscape (around 18,000 years ago), while the small-horned version was drawn when the newly discovered species dominated Europe (after 17,000 years ago). Each species appears to have dominated Europe for long periods of time, alternating in response to major climate changes. Thanks to the accurate artwork of Stone Age people, scientists have a good understanding of what this new species of bison looked like. It had been hiding in plain sight all along. This study has thrown up a number of surprises. Apparently, mammals can form new species by hybridisation, even if only rarely. It also shows that despite the huge bison fossil record the depictions of these ancient creatures made many thousands of years ago, still have a lot to tell us about life in the past. Everything acknowledges the help and support of “The Lead South Australia” in the compilation of this article. The scientific paper: Soubrier, J. et al. Early cave art and ancient DNA record the origin of European bison. Nat. Commun. 7, 13158 doi: 10.1038/ncomms13158 (2016).